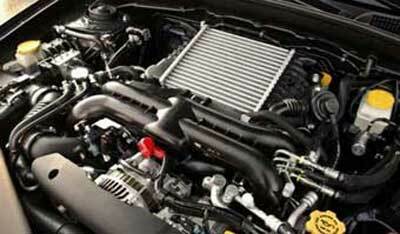 An intercooler and a radiator are similar in what they do but differ in why they do it. They are both heat transferring devices but the radiator is for engine maintenance while the intercooler functions to increase performance. Intercoolers are installed on high performance engines where a turbo or supercharger is present. Their purpose is to lower the temperature of the incoming compressed air from the turbo or supercharger so cool air can be forced into the cylinder reducing the possibility of premature ignition or vaporation of the fuel. Intercoolers reduce the air temperature with the use of external air in most cases. The compressed air flows through tubes in the intercooler, the air is cooled as the heat is transferred to the tubes and the tubes are cooled by the outside airflow that passes over the them and through fins that are attached to the tubes. Intercoolers are mounted on 3 different areas in the engine bay. The intercooler is mounted in the front of the engine under the radiator. This allows it to receive massive amounts of airflow and large intercoolers can be placed in the front. You may see the identification plate at the side when this position is used. The drawbacks are this position creates alot of turbo lag as the air has a longer distance to travel before reaching the cylinder and the intercooler can sometimes restrict some of the airflow to the radiator. The intercooler is mounted on the top of the engine and it is the closest to the engine so it has less turbo lag and the airflow is received through a hood scoop on the bonnet. Top mounted intercoolers receive less air than the front mounted but an adequate amount for their size. The drawbacks of this position is that this intercooler can receive lots of heat from the engine which would cause it to lose its effectiveness to cool the air and a large intercooler cannot be mounted on top of the engine. This intercooler is also mounted in front of the engine but on either side of the car, in front of one of the wheels. These intercoolers are generally smaller and not as effective as the front mounted but they don't block air from reaching the radiator. All three intercooler positions have their advantages but I've noticed that the front mounted is the most prevalent position. The decision of where to place an intercooler will depend on several factors such as the size of the turbo, your tolerance of turbo lag, the position of the radiator and any other factor you consider to be important.